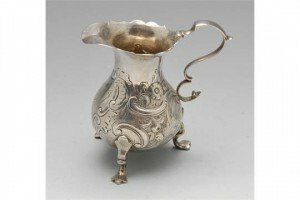 A George II silver cream jug of bulbous form with floral embossing surrounding an engraved crest, standing on three paw feet, scrolling handle and scalloped rim. 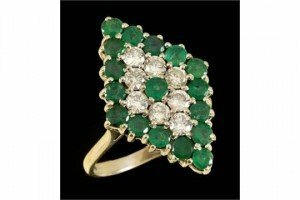 An 18ct gold, emerald and diamond marquise shaped cluster ring, with a diamond cluster and emerald frame and central emerald, marked 18ct. 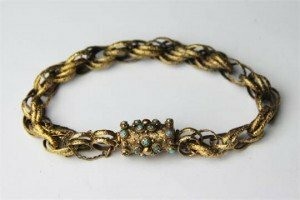 A 19th century gold fancy link bracelet, the barrel shaped clasp set with turquoise and malachite cabochons against a clover leaf decorated ground, each link with textured detailing. 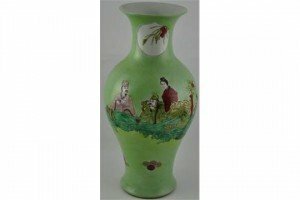 A large Chinese baluster vase decorated with a scene of gentleman practising calligraphy and drinking tea, bears a six character Kangxi mark to base. 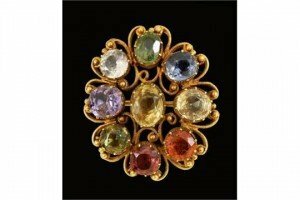 A late 19th Century gold and multi coloured gem set brooch, claw set, with oval shaped sapphires, amethyst and garnets. 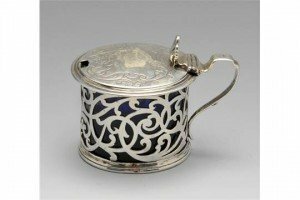 An early Victorian silver mustard pot with blue glass liner, the circular form with foliate scroll openwork sides, hinged lid with engraved floral scrolls and a shell form thumb-piece. 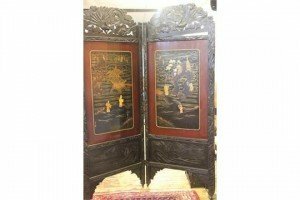 A Chinese mother of pearl inlaid two fold screen, or room divider, each inset with a lacquered panel depicting river landscapes, within a carved hardwood frame. 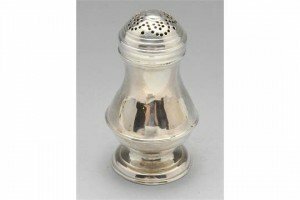 A George II small silver caster, the plain baluster form with girdle detail and raised on a footed base, the removable bun lid with simple drilled piercing. Hallmarked to base only London 1742. 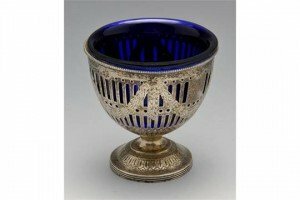 A Victorian silver sugar dish, the conical form with vertical pierced decoration embellished with engraved swags and with blue glass liner. 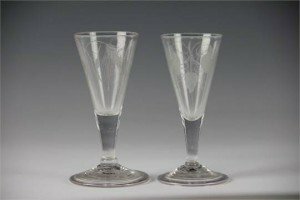 A pair of Victorian ale glasses, each with conical bowl, engraved with wheat ears and hops, raised on plain stem above a folded foot. 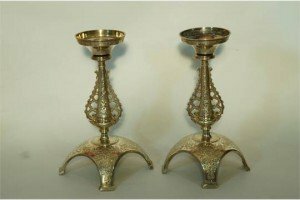 A pair of Victorian silver comport stands, by Edward Barnard and Sons, London 1879, in the Gothic style with engraved foliate decoration. 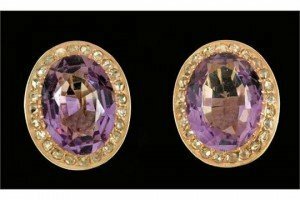 A pair of amethyst and diamond cluster ear clips, the oval shaped amethyst within a frame of rose cut diamonds. 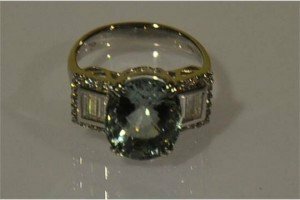 An 18 carat white gold dress ring with central 4.7 carat checkerboard cut aquamarine flanked by baguette diamonds of .39 carat. 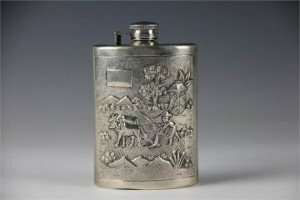 A Burmese sterling silver hip flask, the concave flask with applied cast panels of farmers ploughing, with elephant and mountain beyond. 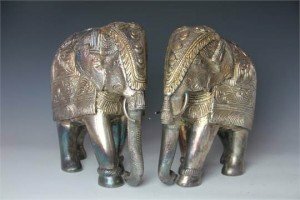 A pair of Indian white metal mounted model elephants, with jewel eyes and decorated with flowers and scrolls. 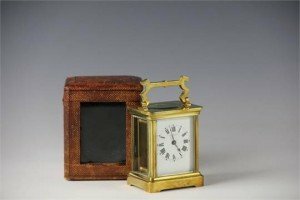 A lacquered brass carriage time piece, within original fitted leather effect case, the white enamel dial with black Roman numerals. 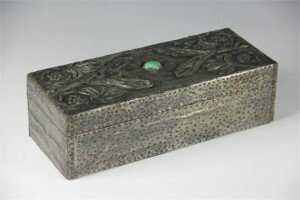 An Art Nouveau pewter covered glove box, the cover embossed with scrolling foliage and central insert green Cabochon stone, lined interior. 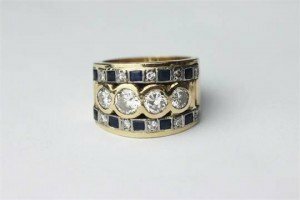 A diamond and sapphire ring, designed as four brilliant cut diamonds, each collet set and flanked by a row of diamonds and square cut diamonds, all set in yellow gold, stamped ‘9k’, weight 14.3 grams. 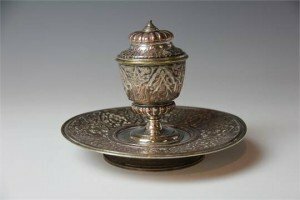 A Victorian electroplate inkwell by Asprey & Co, decorated throughout with Persian inspired flowers and motifs. 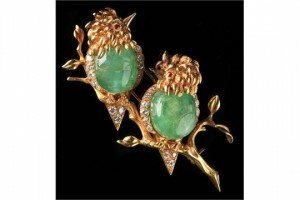 A Van Cleef & Arpels 18ct gold cabochon emerald or chrysoprase, diamond & ruby brooch, modelled as two birds on a branch.